HOME RITUALS Many of Judaism’s key rituals take place in the home: Shabbat candle-lighting, Shabbat dinner, Passover seder, Chanukah candles. Even one lifecycle event, the bris [ritual circumcision] is most often performed at home. JEWISH IDENTITY Everywhere except in Israel, Judaism is a minority religion. Even in the United States, which has a number of large Jewish communities, we are only 2% of the population. For Jews, home is the key place where Jewish identity is formed and nurtured, not only in children but in adults. HOME MITZVOT – There are Jewish commandments that pertain specifically to the home. We hang a mezuzah in the doorways of the home. Cooking and meals have many different mitzvot [commandments] associated with them: blessings, dietary laws, even some rules for cooking. 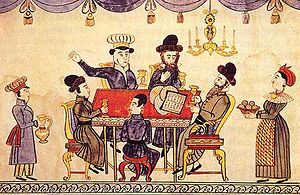 Those may occasionally be performed in a synagogue, but they most often are observed in the home. Even certain safety rules for the home are actually commandments from Torah. MIKDASH ME’AT means “little sanctuary.” Ever since the destruction of the second Temple in 70 A.D., our sages have regarded the home as a primary worship environment for Jews. Torah is a set of instructions for living our daily lives, and those lives take place at home, not at synagogue. If a visitor came to your home, would he or she recognize that it is a Jewish home? What would be the tipoff? How many different ways is your home identifiable as a Jewish home?